He changes the subject whenever marriage comes up. And if he does address it, he only talks about it in a jokey, snarky way. You really have no idea where he stands at all, which is a huge red flag in a relationship. 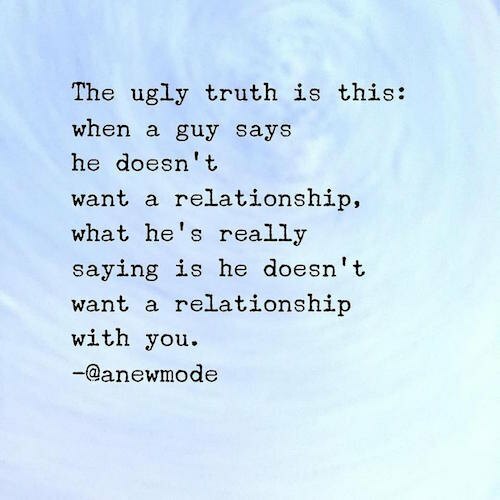 Common responses you get when you try to talk about it are: He needs more time … He needs things in the relationship to change … he needs things in his life to change … Why are you bringing this up now? ….Can we talk about this another time? …Everything is so great, why do you need to wreck it? …I’m stressed at work, I can’t talk about this right now, etc. etc. 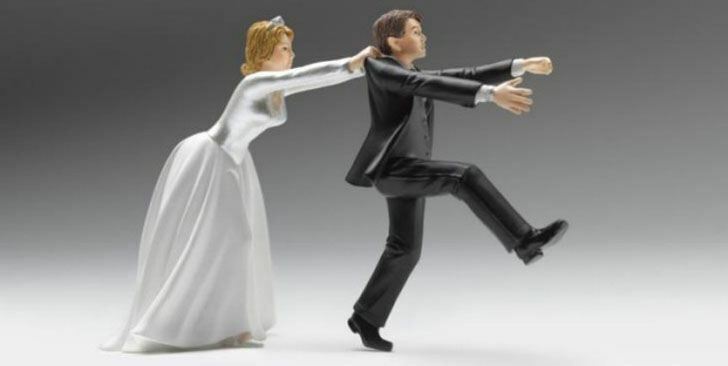 When the topic of marriage or commitment comes up, he gets angry, defensive, and uncomfortable. At the root of it, he probably feels incredibly guilty. 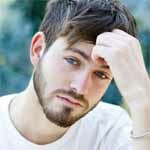 He knows–consciously or sub-consciously–that he doesn’t want to marry you, but he also doesn’t want you to leave, so he resents it when you put him in a position where he has to admit he can’t give you what you want. He wishes you would just leave the topic alone so he doesn’t have to deal with it and this comes across as anger and frustration. Forget marriage, if he won’t even commit to giving you a label and being your official boyfriend (or if you had to badger him into finally calling you his girlfriend), then he definitely doesn’t see you as his lifelong partner. When you bring it up, he might say something along the lines of he likes things how they are, he doesn’t like labels, why change things? These are just empty excuses. When a guy says he doesn’t want to be in an official relationship, he means he doesn’t want to be in an official relationship with you…he’s just enjoying your company in the meantime. He claims marriage is just a piece of paper… it doesn’t really mean anything… no good can come of it. 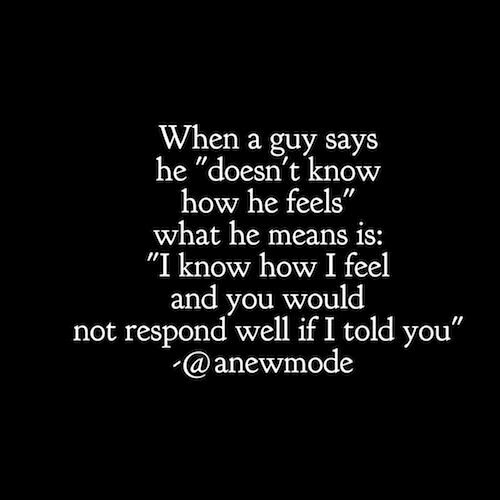 Guys don’t speak in code; when he says something, believe it and don’t read into it. If he says he doesn’t believe in marriage, believe him! Do not make the mistake of seeing this as some sort of challenge. Don’t make it your mission in life to turn him into a believer. Take it for exactly what it is. If you want to get married, and he doesn’t…then you either need to learn to be OK with that or you need to move on to someone who wants what you want. If you haven’t met his friends and family, that’s a huge red flag. If you have met his friends and family, but you don’t really know them, it’s a little less of a red flag but still a flag nonetheless. If he doesn’t really bring you in…he doesn’t really invite you to family functions, doesn’t really include you when he’s hanging out with his close friends, he doesn’t really care if you like them or they like you, then it means he’s not really all that invested in you. You’ve been together for many years, maybe you live together, you know each other in and out…. but he says he just “doesn’t know.” What this really means is he knows… he just doesn’t know how to tell you. Guys usually know early on when they’ve met the one. Ask any married man when he knew his wife was “the one” and the answer will most likely be very early, like well before the six-months-together mark. He won’t talk about problems with you. He withdraws and shuts you out. It almost seems like he’s about to break up with you. He doesn’t let you in and you don’t have a clue about his emotional world. When a man lets a woman in, he’s investing in her. Men don’t readily strip off their masks and show their true colors to the world. They reserve this for a select and very special few. When a man lets you in, really in, he is deeply invested in you. When he builds walls, he’s trying to keep you out. Part of being in a healthy relationship entails being able to handle conflict. This won’t always be perfect, sometimes it will be messier than others, but both partners are on the same team. They are both trying to reach a resolution and they work together to get there. They don’t go into combat like enemies. Essentially, it’s the two of them against the problem, not the two of them against each other. The conflict is a means to find a resolution, not an opportunity to tear each other down. If he completely shuts down when an issue arises, or he deflects the blame onto you and maybe threatens to break up with you, it’s a big sign he’s not ready to get married. Marriage is a life-long partnership. Sometimes these partners don’t agree and that is where the strength of your relationship will come into question. 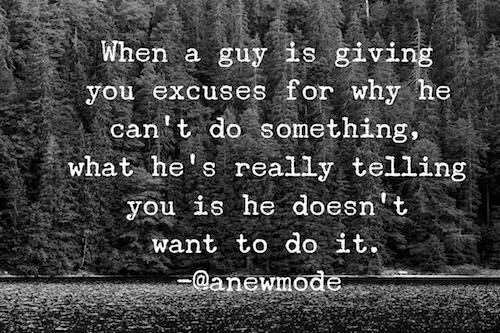 If he won’t talk about it, won’t work on it, and shuts you out, then you can’t have much of a partnership. Instead, you’ll spend your life walking on eggshells for fear of rocking the boat. Conflict can often strengthen a couple. It can be a means for breakthroughs and deeper understanding. In the case of a guy who doesn’t want to marry you, he could be avoiding conflicts about the status of the relationship because he knows deep down he doesn’t want to marry you. At the same time, he doesn’t want to lose you… so he avoids. He avoids conflict and he avoids talking about it. This often isn’t conscious and it isn’t malicious. He may reason that he just needs more time to figure things out and so he pushes the discussion off so he doesn’t have to deal with it right now. Either way, when a guy won’t or can’t work with you when issues arise, it’s a big sign he’s not ready for marriage, or maybe just that he doesn’t want to marry you. He also doesn’t talk to you about his future plans, or if he does, they don’t really seem to include you. As soon as he gets that promotion … as soon as the busy season is over … as soon as he gets settled in his new house .. .as soon as he can afford a really nice ring … as soon as he feels really financially table … as soon as you guys stop fighting so much … as soon as the sky turns green. It doesn’t matter how many of these “as soon as” he achieves, there will always be a new excuse. He’s just buying time with all these excuses about waiting for the “right time” which will come at no time. How do you feel in this relationship? Be honest. If you feel needy, insecure, and desperate, then it’s a big sign you’re in a lopsided relationship, one where you are significantly more invested. You should never have to beg and plead for a commitment. When it’s the right guy, he will eagerly and happily commit himself to you. He will do whatever it takes. 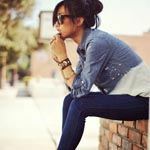 If you feel like you spend most of your time in the relationship convincing him to marry you… or trying to prove to him what a great wife you would be… it’s a sign that he is on a totally different page, a page that doesn’t include you or an aisle. He genuinely feels bad for married people, he thinks their lives are boring, dull, and bleak. When a friend of his gets engaged, he feels pity, not joy. He sees marriage as life in prison with the possibility of parole (i.e. divorce), but that comes at a risk of half your income and he would just rather not. When people ask about the relationship he downplays it and says it isn’t that serious. He doesn’t really seem all that proud to be your man. When a man is truly in love, he wants to show off his lady. He is proud to be her man, he feels like the luckiest guy in the world and he wants to show off his good fortune to anyone and everyone. Another element of this is that his friends and family (if he has introduced you to them) don’t treat you like you’re someone special to him, you’re just another girl. When a guy has found “the one” it’s just obvious and his friends and family all know it…and it comes across in the way they treat his girl. Maybe he finally caved and he popped the question … but he still clearly doesn’t want to get married. Why would he do something like that? Maybe he wants to be sure and thinks if he makes a big move it will get him there. Or maybe he’s just buying more time, literally. If you’ve been engaged for a few months and he still hasn’t set a date, and there isn’t a legitimately good reason why, odds are he never will. Sometimes you can get so caught up in trying to get him to choose you that you forget to ask yourself if he’s even right for you. You know the truth deep down, it’s just not always easy or pleasant to admit it. There you have it. 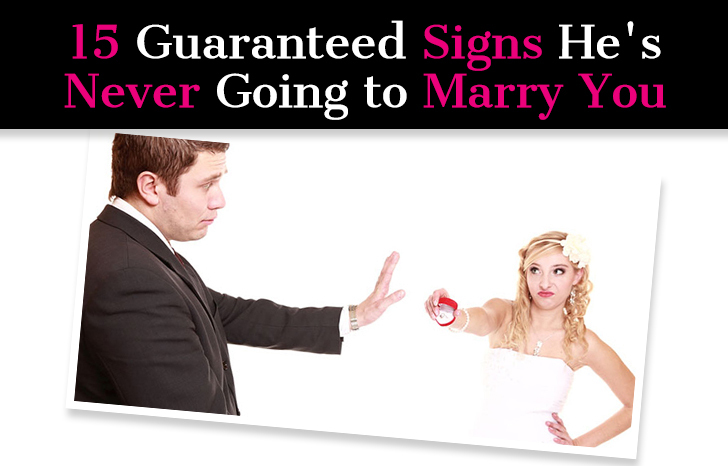 Signs he’s never going to marry you. I know this can be depressing to read, especially if more than a few of these ring true, but it’s better to know now. Don’t cheat yourself out of having what you want. Don’t stay with someone who clearly can’t give you what you want just because you’re afraid to go out there and start again from scratch. It’s much better to be alone than with someone who isn’t right for you. MGTOW is getting stronger by the day for many of us good single very smart men because of Feminism.